To finish off their lessons on INSECTS, my 3.5yo had a Bring-A-Bug day at his kindergarten the other day. We spent all morning hunting for a bugs in the garden – but found none. I felt like such a crap mother. I don’t know why I couldn’t find a cool bug. Maybe it was just the wrong time of day to be catching bugs. I ended up catching an ANT for him. I put it in a container and I tried to convince him how cool ants were. We put sticks, leaves, dirt and rocks into the container, to make the ant feel more at home. Thankfully my husband came home that afternoon and – lo and behold – our garden was teaming with life. 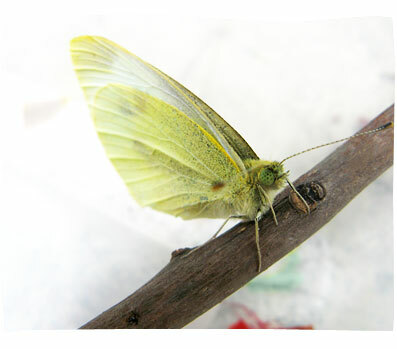 In 2 minutes, he found a “yellow butterfly”, which he gently cupped and added to our ant environment. With my waistline expanding, I’ve been looking for some maternity wear to accomodate my changing shape over the next several months. But I also want them to look pretty stylish. I am already a fan of FashionJunkee, and most of their dresses and tops are made from that soft, stretchy, cottony material – comfy, breathable, and clings to all the right places. 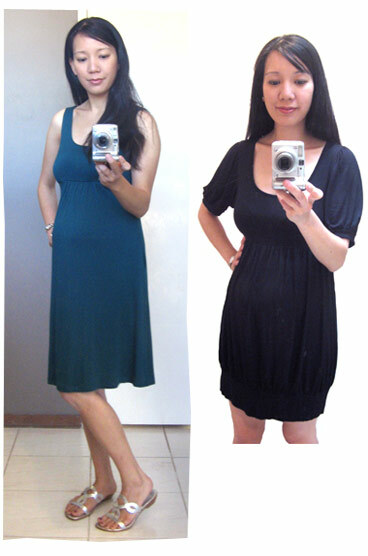 So I got my hands on some gorgeous styles that I could wear as a normal dress and as a maternity dress. I’m so happy with them. Plus they are cheaper than many “proper” maternity dresses. I wore the magenta dress to a salon launch event the other day. It was the first time I wore a such “hot” dress with my growing baby bump. One side of my head was going “Hey if I’ve got a bump, I should flaunt it!” and the other side was saying “I know I’m PREGNANT, but I look BIG in this dress! Will people even realise that I’m pregnant??”. So I must admit, I felt a little timid as I arrived at the event. But I got compliments! Random people were coming up to me and saying wow you’re pregnant, you look great, what a great dress etc. It was a bit weird being labelled “that pregnant woman” at the party. But heh, it made me happy. So I wore the mocha dress (right) to a fashion show a few days later, and again I received nice comments! These styles above are more everyday and casual. The teal one has been perfect for throwing on when I rush out the door to pick up the boys from school, or just hanging around at home on a hot afternoon. Stretchy and so comfy. The black one is much more versatile, making it easy to dress it up or down, for day time or night. I adore this grey dress because it doubles as a long top! Ah, it’s SO comfy and breathable. I’d wear it more often, but haha I’m so embarrassed when people point it out more than once. I might have to get some similar styles in different colours now. Check out the whole range of off-shoulder tops / mini dresses. I have the short sleeve one in grey. This rouched-sleeve one also looks really nice. I really admire FashionJunkee for being such a charity conscious and globally aware company. So I also got two cool t-shirts for my boys. 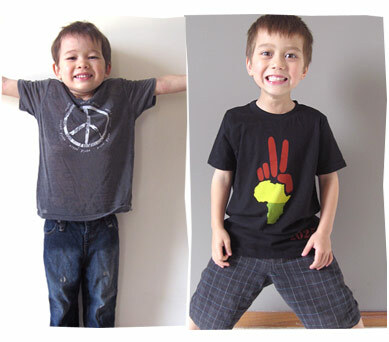 Sean wears the Vintage World Peace Tee by LollipopZen. Callum wears the Omni Peace t-shirt by Signorelli (50% of procreeds go to charity). They have a charity page where they sell t-shirts, tops and tanks by Signorelli, with proceeds going to Omni Peace & Children’s Health Fund tees. Very cool. After my husband initiated a heap of outdoor, boy-projects for the kids, I really felt that I was missing out on connecting with my sons. I read somewhere that by the age of 9, children should be able to prepare a meal for the whole family. Now I LIKE THAT IDEA. I like the idea of raising young men who can cook a 3 course meal by the age of 17. So. 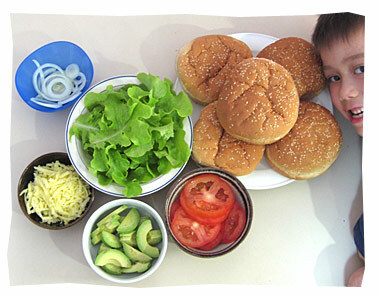 I have set up a once-a-week session where I help my 5.5 year old son make dinner for the family. A meal of his choice. 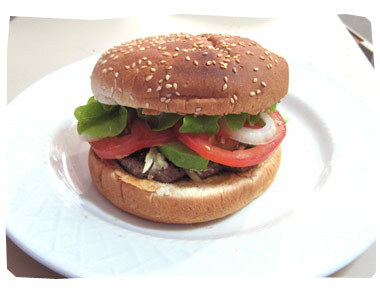 Tonight he chose homemade hamburgers. 1. 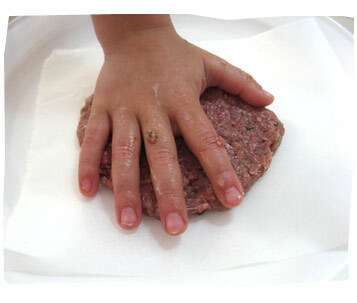 Use a food processor to chop onion, parsley and 1/3 portion of beef. 2. Throw processed mixture into a bowl, add rest of beef, egg, flour, sauce, good seasoning of salt and pepper. 3. Mush it up and mix well with your hands and fingers! 4. Divide mixture into 6 balls. 5. 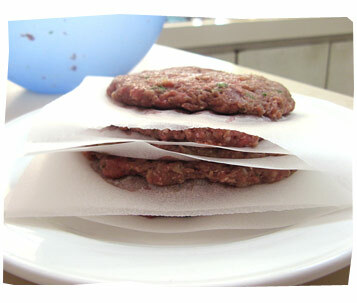 Cut out large squares of baking paper and press beef balls into patties, about 1.5 cm thick. 6. Wrap it up in cling wrap and put in fridge for 30 minutes. 7. Fry on a lightly oiled pan for a few minutes, until cooked. My son did really well throughout the whole preparation and cooking process. He plucked and washed the lettuce. Cut up the avocado. Grated the cheese. Buttered the buns. He even fried the patties quite well. I treated the whole session like I was just helping him out. So I didn’t have that tense STRESSFUL build up of patience and frustration inside me. It was more like I was trusting his ability and allowing him to grow up. I showed him how to do something, showed him how it might go wrong, give him a few safety tips, and just LET HIM DO IT. As he was frying the patties. I was laughing to myself, thinking – You’d better get used to this buddy, when you’re 15, you’ll be flipping burgers to earn your pocket money. They turned out really well! They were yummy and healthy!